AMERICA/HONDURAS - The Bishops and the "human tragedy" of the caravan: "we were deaf to the cries of their rights"
The Bishops and the "human tragedy" of the caravan: "we were deaf to the cries of their rights"
Bishops for the elections: "Restoring politics, democracy, rule of law and hope"
Tegucigalpa (Agenzia Fides) - The Bishops of Honduras are concerned about the serious migration crisis of thousands of Hondurans who are leaving the country. The caravan now has arrived in Mexico, and the US government has announced retaliation and forbidden their entry. In a statement also sent to Fides, the Episcopal Conference of Honduras defines the mobilization of so many people a "human tragedy" and expresses pain and concern for the delicate situation created. The Bishops therefore ask the Honduran government to intervene as soon as possible and stop the country's crisis, a crisis never seen in the history of the Central American nation. "It is the duty of the Honduran State to provide its citizens with the means to satisfy their basic needs, such as decent, stable and well-paid work, health, education and housing, and when these conditions do not exist, people are forced to live in tragedy and many of them hope to undertake a path that leads to development and improvement, finding themselves in the shameful and painful need to leave their families, their friends, their community, their culture, their environment and their land", emphasizes the declaration. "We were deaf to the cries of their rights and blind to see that reality. 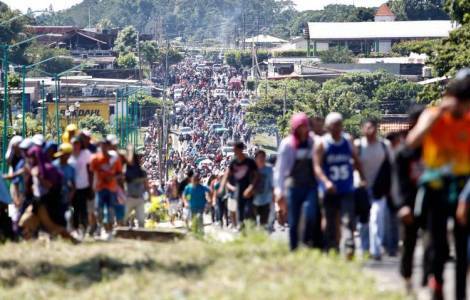 The news of this caravan is the massive form of thousands of people, mostly young people, who go with the hope of obtaining sufficient resources to transform Honduras", the text continues. In conclusion, the Bishops thank the neighboring countries for the reception and the aid provided towards Hondurans, reminding everyone of the Pope's request: "welcome, protect, promote and integrate migrants".